In aiding the Libyan rebels, Qatar being asked to help in rebuilding of Libya. As Libya’s rebels mounted what they hoped was a final assault on Tripoli in their battle against Col. Moammar Gadhafi, they directed much gratitude in their six-months-long battle to one tiny, Gulf Arab state: Qatar. A rebel fighter stood in front of a maroon-and-white Qatari flag in Gadhafi’s compound in Tripoli Wednesday. After leading the region in training, equipping, and funding Libya’s opposition, Qatar is now best-poised to help mediate a political transition and employ some of its companies and expertise in a post-Gadhafi Libya, officials and analysts say. One of the Libyan opposition leaders, Mahmoud Jibril, on Tuesday thanked Qatar for supporting the rebels despite enduring “all the doubts and threats.” Another top opposition figure, Mustafa Abdul Jalil, told Qatar’s state news agency the country “played a leading and decisive role since the outbreak of the revolution.” Mr. Jibril spoke from the Qatari capital, Doha, which has served as a defacto operational base for the Libyan opposition in the Gulf. Small but wealthy, gas-rich Qatar is now reaping a foreign-policy success from its early support for Libya’s rebels—roughly a month into their uprising—carving an outsized role for itself in the Arab Spring in contrast to conservative Gulf monarchies invested in stability. Though Col. Gadhafi had alienated some of the Gulf’s sheiks, Qatar tried in recent years to forge warm business relations in Libya. In Doha, Libyan opposition leaders meeting with Arab and allied officials on Wednesday will kick-start talks on releasing some of the tens of billions of dollars locked up in Libyan frozen assets, with the rebels seeking $5 billion for the short-to-medium term. The meeting will also involve the logistics of a political transition, rebel officials said. There will be a followup meeting in Istanbul and other meetings elsewhere. During the conflict, Qatar took a leading diplomatic role in trying to hasten the Gadhafi regime’s collapse, as it sought advice this month from Shokri Ghanem, Libya’s former oil chief, and Moussa Koussa, the former foreign minister, said people familiar with the matter. Qatar has also been spearheading talks on the option of a peacekeeping force for Libya’s transition process. The country has said it would be willing to contribute troops to the mission, a move likely to be welcomed by Western nations wary of contributing soldiers, a senior European diplomat said. “Out of all the Arab countries, the rebels trust the Qataris more than anyone else,” said Shadi Hamid, director of research at the Brookings Doha Center. “I assume you will have a divided political arena in Libya in the coming months, once the rebels realize they don’t have as much in common as they thought they had, and the Qataris could play a positive role in that.” Qatar has built a track-record as a neutral arbiter in some of the Middle East’s most heated conflicts, from political stalemates in Lebanon to rebel talks in Yemen. It has managed to play off sides in the struggle for regional dominance, staying a friend of Iran—with whom it shares the world’s biggest gas field—while hosting the U.S.’s major air base in the Gulf. “Having close military relations with both sides of the Arab cold war—that’s pretty remarkable,” Mr. Hamid said. “No one else plays that balancing act.” Much of that creative foreign policy has drawn the ire of Saudi Arabia, a larger and more powerful Gulf state, for whom Qatar’s rise to global prominence has been more of an annoyance than a threat. In March, Qatar fell in line with the Gulf Cooperation Council’s move to send Saudi troops into Bahrain to defend that monarchy against a rebellion. But Qatar also took the lead on Libya’s uprising, even after the council, the collective bloc of Gulf states, provided the Arab political cover for Western military intervention. It was the first Arab country to send its jets to Libya, to recognize the rebels’ National Transitional Council, or NTC, and to market crude oil produced in rebel-controlled fields. It provided the rebels with uniforms and helped them get a television station on air. At some risk, Al Jazeera, a pan-Arabic broadcaster backed by Qatar’s royal family, has also served as a voice for protesters across the Arab world, while becoming a focal point of discontent for governments facing protests. An Al Jazeera camera-man was killed in an ambush near Benghazi and several of the station’s journalists attacked in March. Qatar is likely to keep a role in oil trading in Libya, having already helped the rebels sell cargoes of crude and delivered petroleum products to them in Benghazi, energy analysts say. It may also use its expertise as the world’s biggest exporter of liquefied natural gas to help overhaul a small LNG plant in Brega. Libya’s rebel government, too, could be looking to leverage its ties with other Gulf countries that supported their plight, analysts say, especially as Libyan officials had often looked to the Gulf for examples of how to diversify oil-reliant economies and invest wealth. “It’s not a single country that’s helping—the NTC is working now with all of its international partners,” said Aref Ali Nayed, the Libyan ambassador to the United Arab Emirates, another Gulf country that took the lead in approving a no-fly zone over Libya and sending in humanitarian aid. “The Libyan people are very proud people, they will never forget their friends,” Mr. Nayed said. Though Qatar is a small nation, over the past few years it has expanded its influence in the Middle East mainly due to its wealth. Qatar also wants to be an active player in the region. Being supportive and aiding the rebels helped increase its strategic objectives with minimal cost. With Gaddafi removed from power in Libya, the European Union will lift sanctions against Libya. European Union diplomats say sanctions against several Libyan ports, oil companies and more than a dozen other entities could be lifted as soon as Friday. 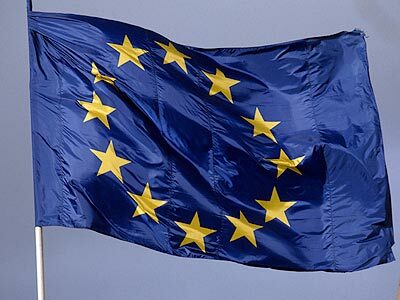 The EU’s 27 members reached a preliminary agreement Wednesday in an effort to help Libya’s National Transitional Council resume normal economic activity. Diplomats say they expect a final agreement on Thursday. France, meanwhile, has asked the sanctions committee of the United Nations Security Council to allow Paris to release more than $2 billion of frozen Libyan assets. The sanctions committee has already approved similar appeals by Britain and the United States, releasing a total of more than $3 billion in seized Libyan assets to address urgent humanitarian needs. The NTC (National Transition Council) will be able to raise revenue through the resumed selling of oil on international markets as it pivots from being an insurgency led coalition to a governing one that is held accountable. The ability to use oil revenue to fund and rebuild will be crucial. South Africa to take over for Libya and host African Cup of Nations in 2013. South Africa pose before their 2012 Cup of Nations qualifier with Egypt in Johannesburg . Following the political and civil unrest in Libya, South Africa has agreed to host the African Cup of Nations in 2013. The South African Football Association said on Thursday it had signed an agreement with Libya’s football federation to host the 2013 African Cup of Nations in place of the troubled north African nation. In its statement, SAFA said the agreement will see Libya stage the 2017 Cup of Nations, which was initially awarded to South Africa, with the 2010 World Cup host country taking over the African Cup in two years’ time. Libya’s staging of Africa’s top football championship had been in doubt since the uprising against dictator Moammar Gadhafi. The Confederation of African Football denied the 2013 tournament had already been taken away from Libya, but conceded the country’s hosting would be discussed by the ruling body’s executive committee next month. SAFA had said its deal to swap tournaments with Libya must still be confirmed by CAF at that executive committee meeting in Cairo on September 28. “All the issues regarding 2013 will be discussed at the end of September,” CAF spokesman Suleiman Habuba said later on Thursday. 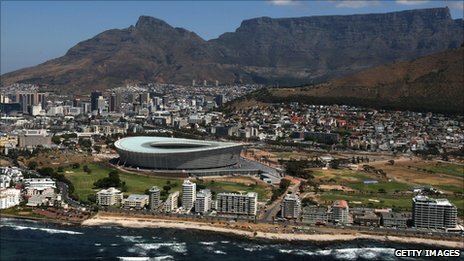 South Africa will be hoping to make use of the stadiums built specially for the 2010 World Cup, like Greenpoint in Cape Town. The South Africa-Libya agreement also covers the 2014 African Nations Cup, a tournament for emerging players, which was also to be hosted by Libya, SAFA said. SAFA added the deal had come “following the political upheaval in Libya,” but did not give details on when it had been signed. South Africa already stepped in this year to cover for Libya by organising the African Youth Championship at short notice in Johannesburg in April. Libya’s civil war has escalated this week with anti-Gadhafi rebels taking over much of the Libyan capital Tripoli and overrunning Gadhafi’s personal compound, forcing the longtime ruler to retreat into hiding. Egypt was reportedly also interested in hosting the 2013 Cup of Nations should it be taken away from Libya, while Nigeria was the reserve host after it lost out in the initial race to host the event. However South Africa, with its existing infrastructure from last year’s World Cup, is regarded as the best choice for CAF as a stand-in host. Gabon and Equatorial Guinea will co-host the next African Cup of Nations in January and February next year, while another north African country, Morocco, will hold the 2015 tournament. Africa has back-to-back Cup of Nations tournaments in 2012 and 2013. The current political and security environment in Libya is not yet stable enough for an event such as this to be hosted in the country. Once security is handled and some normalcy returns, maybe then Libya might entertain the idea of being a host country to tournaments like the African Cup of Nations.